I’ve moved into my new house and am starting to settle in. God has been very gracious to me and Joe. 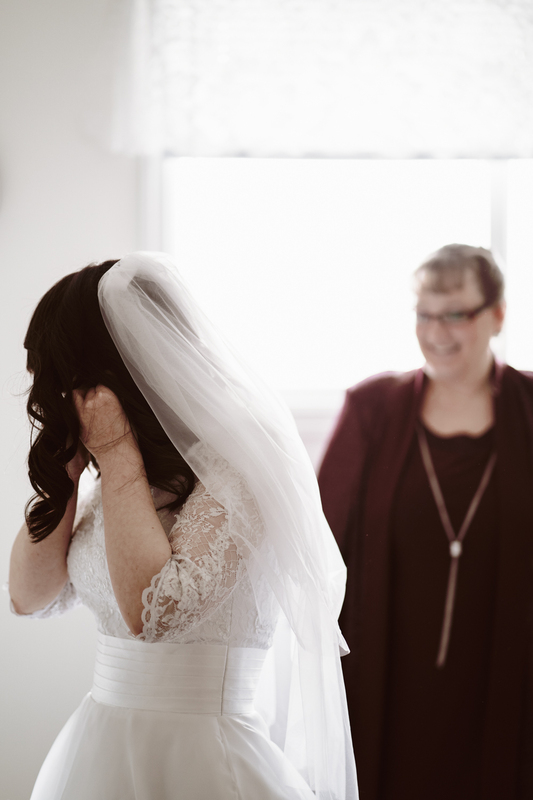 The day was absolutely spectacular, largely thanks to my wedding planner extraordinaire, my mom. Our wedding venue, Bayside Camp and Retreat Centre, was also amazing. Bayside’s situated on a lake that was frozen on our wedding. The actual day of the wedding (March 23) was overcast and chilly but it didn’t rain until after Joe and I left. We got ready at my parents’ house and my talented friend Catherine did my hair and makeup. Our house was pretty busy with my bridesmaids, relatives, and our killer photographers. But my momma helped me get ready in my dress, which I bought online (!) from JJsHouse.com. I did have to get it slightly altered, but the dress was perfect. My parents are the best. They also clean up really nice. My bridesmaids are beautiful and hilarious. So the flowers. They’re actually from a local grocery store. Flowers really weren’t a huge deal for me, so my bouquet is a simple mixture of baby’s breath and white wildflowers and arranged by my mom and bridesmaid Mandie. Our venue had a sweet girl who does chalkboard art decorate this welcome board when people entered the lodge. Having my dad perform our ceremony and marry us is one of the coolest parts of our wedding. The real MVPs — our wedding party. One of our first pictures together after being married. I’m giddy. We like each other a lot. We had matching black umbrellas In case it rained (it didn’t). But Joe really wanted a picture with an umbrella… so here it is. We had breakfast for supper! It was delicious (especially the croissants) and everybody loved it. One of our pastors and friends, Jake, was our MC and did an incredible job. My dad gave the best father-of-the-bride speech ever. He roasted me hard (because that’s his love language), and it was hilarious. Joe’s mom made our wedding cake, which was really special. This is us pretending like we know how to cut the cake… when we really don’t. One thing Joe and I both felt strongly about was that he was not going to smash cake into my face. That face went through a lot to look decent on our wedding day. ;) So in this picture he’s gently putting cake into my mouth. He’s nice. I’m glad I married him. Sign up for her monthly newsletter here!